NEW YORK, Sept. 5, 2014 (Xinhua) -- UN Secretary-General Ban Ki-moon (R) speaks; Director-General of WHO, Dr. Margaret Chan looks on, UN headquarters, New York, Sept. 5, 2014. UNITED NATIONS, Sept. 5 (Xinhua/Sun) -- UN Secretary-General Ban Ki- moon said Friday that the world organization is going to establish an Ebola crisis centre to stop the spread of the virus in six to nine months. 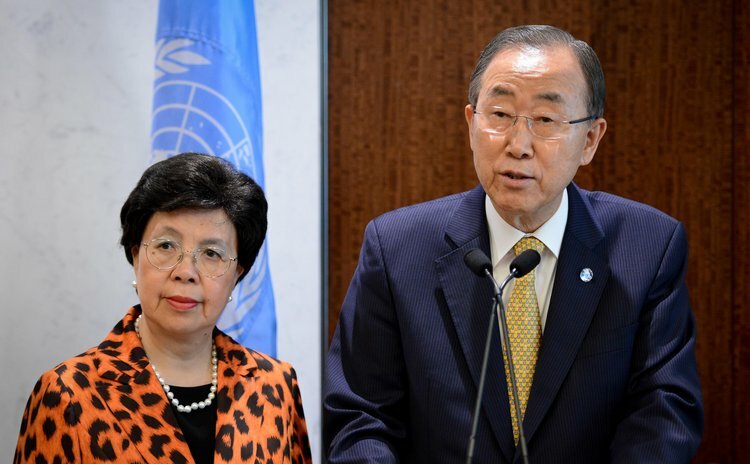 Ban made the announcement after a meeting on the Ebola epidemic with senior leaders and experts from across the United Nations system, including Director-General of the World Health Organization (WHO), Dr. Margaret Chan, and Senior UN System Coordinator for Ebola, Dr. David Nabarro. "We are together today to send out an international rescue call, " Ban told reporters. "What began as a public health emergency is evolving into a social and economic challenge for millions." "At the meeting we have just held, we agreed to establish an Ebola crisis centre to bring synergy and efficiency to the efforts of these many partners within and beyond the United Nations," he said. "The goal is to stop Ebola transmission in affected countries within six to nine months, and to prevent the international spread of the virus," the UN chief added. According to WHO, more than 1,900 people have now died in West Africa since the outbreak of Ebola early this year and that there were about 3,500 confirmed cases in Guinea, Sierra Leone and Liberia. World Bank President Jim Yong Kim and many heads of agencies and funds and programs, such as the United Nations Development Program (UNDP), the United Nations Children's Fund (UNICEF), the United Nations Office for the Coordination of Humanitarian Affairs (OCHA), also joined the Friday teleconference via video. When briefing reporters here on the meeting, the UN chief stressed that "it is crucial to remember that Ebola can be avoided and controlled." "The virus has been contained elsewhere in the past, and we can do it today as well," Ban said. "We know what to do and what needs to be done." Noting the next few weeks would be "crucial", Ban called on the international community to contribute to the WHO Roadmap and provide the 600 U.S. million dollars needed for supplies in West Africa. On Aug. 28, the WHO issued a roadmap to guide and coordinate the international response to the outbreak of Ebola virus disease in West Africa, which it said will serve as a framework for updating detailed operational plans. The UN secretary-general also underlined the importance of " better awareness and understanding" about the Ebola virus, adding that "stigma and rumour can do just as much damage as the virus itself." He urged airlines and shipping companies not to cancel flights and docking to the affected countries. "Banning flights and shipping services will not keep Ebola from spreading, but it will keep medical teams from reaching people most in need." The UN chief also noted that the goal to stop Ebola transmission within six to nine months can be achieved "only if the urgent and necessary mobilization is done both in the affected countries and by the international community." "We have seen the courageous responses of health personnel. We are determined to show our solidarity with them and scale up our efforts to tackle the epidemic," Ban said. "This is a huge, serious challenge. We are organizing to meet it. I am convinced we can succeed," he added.